Sequences planned are Axial FLAIR, T1, T2, Post contrast T1, Cor Post contrast T1, T2*GRE, Non contrast 3D TOF MR Angiogram of Brain. An abnormal enhancing soft tissue in sellar and bilateral para sellar region, obliterating cavernous sinuses, encasing cavernous portion of bilateral ICAs, aneurysmal out pouchings on right side (Green asterisks) with low signal intensity thrombus in it on T2*GRE. Part of this abnormal soft tissue seen at the roof of sphenoid sinus on coronal post contrast T1 (yellow asterisks). 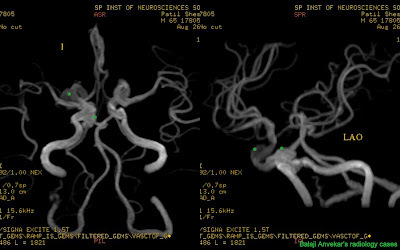 Imaging wise diagnosis : Mycotic aneurysm. Sphenoid sinus biopsy and histopathology revealed fungal infection. Cerebral mycotic or infective aneurysm, a rare complication of infectious illness, and such aneurysms of the intra cavernous portion of the internal carotid artery, most often have been described as a consequence of cavernous sinus infection in an immunocompromised host. An infectious break in the wall of an artery with formation of a blind, saccular out pouching. The Aorta, Peripheral arteries, Cerebral arteries, and visceral arteries are involved in descending order of frequency. Clinically apparent infected aneurysms are often diagnosed at an advanced stage or are associated with complications, such as rupture. Often has a poor outcome with high morbidity and mortality from fulminant sepsis or hemorrhage. Staphylococcus and Streptococcus species are the most common causes of infected aneurysms. Gram-negative bacteria, such as Escherichia coli,Klebsiella, and Pseudomonas are the uncommon causes of infected aneurysms, are becoming more frequent. Mycobacterium and fungi, such as Candida albicans and Aspergillu), are rare causes of infected aneurysms. Sterile blood cultures known to occur in 18%–50% of cases with infected aneurysms.